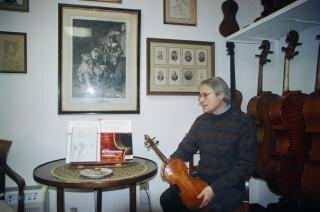 Gael Francais is the last direct descendant of a long line of prominent luthiers and violin dealers that originated in the seventeenth century in Mirecourt, France. In 1880, Gael's greatgrandfather, Henri Francais, joined the renowned house of violin making and violin dealing of Gand & Bernardel Freres in Paris which was founded by Nicolas Lupot in 1796. In addition, the Francais family line has produced the famous houses of violinmakers and dealers of Caressa and Francais, established in Paris in 1901, and Jacques Francais in New York. As the son of a French diplomat, Gael was born in Rio de Janeiro, Brazil and spent his youth living in many different countries in Europe, Africa, and Asia. At the age of 20, he decided to return to the roots of his family tradition and take up the craft of violin making. He began his training in the violin making school of Mittenwald, Germany, followed by an apprenticeship in the atelier of Apparut-Hilaire in Mirecourt, France. In 1974, Gael came to USA to join the violin shop of his uncle, Jacques Francais, in New York. Here he received his training in expertise by Jacques Francais and in repair and restoration by Rene Morel and Luiz Bellini. In 1979, Gael opened his own violin shop in New York where he divides his time between repair and restoration, and dealing in rare antique and contemporary stringed instruments and bows. In 1983, Gael became a full member of the American Federation of Violin and Bow Makers, Inc., an association of America's foremost professional violin makers and restorers. In 1986, he was accepted as full member of the International Society of Violin and Bow Makers (Entente Internationale des Maitres Luthiers et Archetiers d'Art), an organization of highest professional standards. In 2012 Gael and his wife Angela decided to return to the place of her childhood, the Bavarian village of Piding, near the spa-town of Bad Reichenhall, located in close proximity (10 miles) to Salzburg and to relocate his shop there, under the name of "Gael Francais Geigen Atelier". This move enabled Gael to continue his craft and offer his professional service to all string players, within an environment which blends the energy of the Austrian city of music and Mozart's birthplace, Salzburg, with the natural beauty of the Alpine spa-town of Bad Reichenhall. He is looking forward to work with local musicians as well as visiting guest artists, and he is especially looking forward to welcome his musician friends from across the world during their visit to Salzburg or Munich.